Apollo is one of the most important and most complicated gods in the Greek Pantheon. If you've taken even a slight interest in Greek mythology, you've probably heard of Apollo as the Sun God and have seen pictures of him driving the chariot of the sun across the sky. But, did you know that he is never mentioned or depicted driving that chariot in Classical Greek literature and art? Or that his origins may not even be Greek. 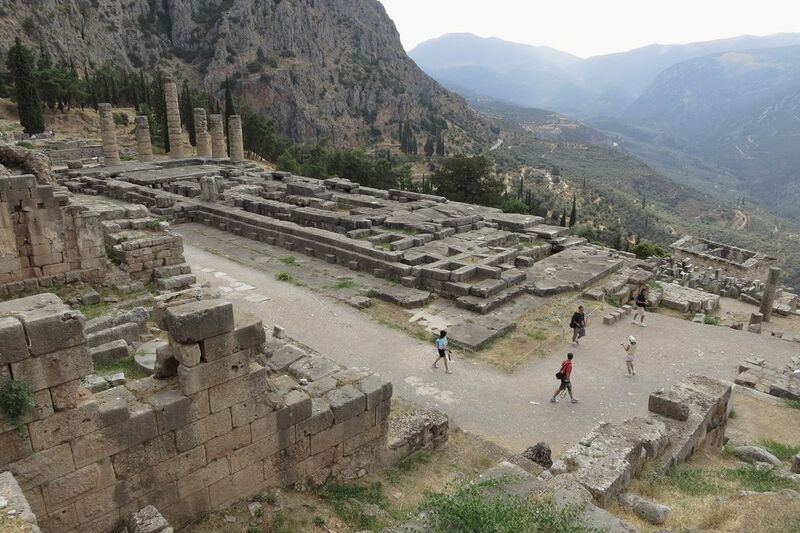 If you are planning to visit the UNESCO World Heritage Site of Delphi at the foot of Mt. Parnassus, the site of Apollo's most important temple in the ancient world, or one of his many other temples, a little bit of background will really enrich your experience. Apollo, a handsome young man with curly golden hair, was the son of Zeus, most powerful of the Olympian Gods, and Leto, a nymph. Zeus's wife (and sister) Hera, goddess of women, marriage, family, and childbirth, was outraged by Leto's pregnancy. She persuaded the spirits of earth to refuse to allow Leto to give birth anywhere on its surface or on its islands at sea. Poseidon took pity on Leto and led her to Delos, a floating island so, not technically the surface of the earth. Apollo and his twin sister, Artemis, goddess of the hunt and wild things, were born there. Later, Zeus anchored Delos to the sea floor so it no longer wandered the seas. Was Apollo the Sun God? Not exactly. Though he is sometimes pictured with rays of the sun emanating from his head or driving the chariot of the sun across the sky, those attributes were actually borrowed from Helios, a Titan and an earlier, figure from Greece's pre-Hellenistic Archaic period. Over time, the two became blended, but Apollo, an Olympian, is more properly considered the god of light. He was also worshipped as the god of both healing and diseases, of prophecy and truth, of music and arts (he carries a lyre made for him by Hermes) and of archery (one of his attributes is a silver quiver filled with golden arrows). For all the sunshine of his creativity and good looks, Apollo also has a dark side, as the bringer of diseases and trouble, of plague and of murderous arrows. And he has a jealous and short temper. There are many stories about his bringing tragedy to his lovers and others. He was once challenged to a musical contest by a human named Marsyas. He eventually won - partly through trickery - but afterward, he had Marsyas flayed alive for daring to challenge him to a contest. Cassandra, the daughter of the king and queen of Troy. To seduce her, he promised the gift of prophecy, but when she still rejected him he cursed her so that she could only foresee tragedy and no one would ever believe her. Daphne, a water spirit, pleaded with her father to save her from the sexual attentions of Apollo. He turned her into a laurel tree. Clearly, Apollo must have carried a torch for her ever after, because he is often depicted with a crown of laurel leaves. Cyparissus, a beautiful young man. Apollo gave him a tame deer for a pet but he accidentally killed it with a javelin while it slept under a tree. Cyparissus died of grief but not before begging Apollo to allow him to cry forever. Apollo turned him into a Cypress tree. The tree's sap sits in droplets on its bark like tears. Acacallis, a maiden from the Samaria Gorge on the island of Crete who was spurned by her proud family for choosing a "foreign" Greek god. In fact, he may not have been Greek at all. Some scholars suggest that his story is distinctly Asian and he may have originated in the Middle East. Among his major sites outside of Greece is the Temple of Apollo Smintheus at Çanakkale, Turkey. ​Most of his encounters seemed to end in pregnancy and he apparently fathered more than 100 children including Orpheus with the muse Calliope and Asclepius, a semi-divine hero and patron of healing and medicine. With Cyrene, the daughter of a king, he fathered Aristaeus, a son, and demigod, the patron of cattle, fruit trees, hunting, husbandry, and bee-keeping, who taught mankind dairying and the cultivation of olives. Delphi, a few hours from Athens, is Apollo's most important site in Greece. The remains of one of his temples crown the site with columns. But, in fact, most of the multi-acre site - crammed with "treasuries", shrines, statues, and a stadium - is dedicated to Apollo. It is the site of the "omphalos" or the navel of the world, where the Oracle of Apollo held court for all comers and sometimes issued puzzling prophecies. The Oracle once prophesied in the name of the Earth Goddess Gaia, but Apollo stole the oracle from her when he slew a dragon known as the Python. One of Apollo's many labels is Pythian Apollo, in honor of this event. The importance of Delphi in the ancient world was as a place of guaranteed peace, where leaders from all over the known world - representatives of the Greek city-states, Cretans, Macedonians, and even Persians - could come together, even if they were warring elsewhere, to celebrate the Pythian Games, to make offerings (thus the treasuries) and consult the Oracle. In addition to the archaeological site, there is a museum with remarkable objects found there. And, before you leave, stop for refreshments on a terrace overlooking the valley between Mt. Parnassus and Mt. Giona, to gape at the Crissaean Plain. From the slopes of Parnassus, all the way down to the sea, the valley is filled with olive trees. Much more than a huge olive grove, this is known as the olive forest of the Crissaean Plain. There are millions (maybe billions) of olive trees still producing Amfissa olives. They have been doing that for more than 3,000 years. It is the oldest olive forest in Greece and probably in the world. When: Open year round, from 8 a.m. to 3 p.m., last admission 2:30 p.m. There is quite a complicated list of special free days and closed days so it's a good idea to consult the Greek Ministry of Culture website before you go. Admission: Full price admission for the museum and the archaeological site is 12€, (Around $14) and reduced-price admission is 6€ (around $7). Once again, consult the website to decide which admission price is right for you. How to Get There: It's about a 2 and a half hour drive from Athens. It is possible to get there by public buses but that can be intimidating because very little English is spoken by the bus drivers or at the bus terminals. Your best bet is to join an organized tour. Travel company offices all over Athens and the rest of Greece can sell you day trip tours to Delphi. Apollo, in some places, replaced the earlier solar god, Helios. High mountain tops were sacred to Helios, and today, churches dedicated to Saint Elias are often found in these same spots - a good clue that an Apollonian temple or sanctuary might once have enjoyed the same views.